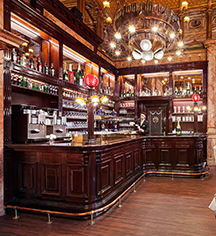 The Hotel Metropole offers a variety of Brussels dining options, including the room "Le Jardin Indien" and the brasserie-restaurant "Café Métropole" where guests dine in a famous and particular Art Nouveau ambiance featuring a coffered ceiling, 3 gigantic chandeliers and its terrace. Guests savor diverse menus "à la carte" served with Belgian craft beers or wine selected by the wine waiter. 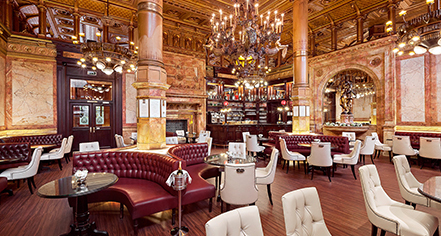 This luxurious brasserie welcomes its guests in an Art Nouveau environment in which the original decor has been kept; both the building’s interior and exterior have been classified. Guests can choose to sit either inside, in the intimate yet lavish interior of the Café, or outside on the heated terrace, which is open all year round, to be closer to the city’s hustle and bustle. The Jardin Indien breakfast room presents guests a relaxing start to the day with its exotic décor. The breakfast buffet is composed of a wide selection of delicacies to satisfy all appetites. The room "Le Jardin Indien" can also accommodate private events for up to 180 people.